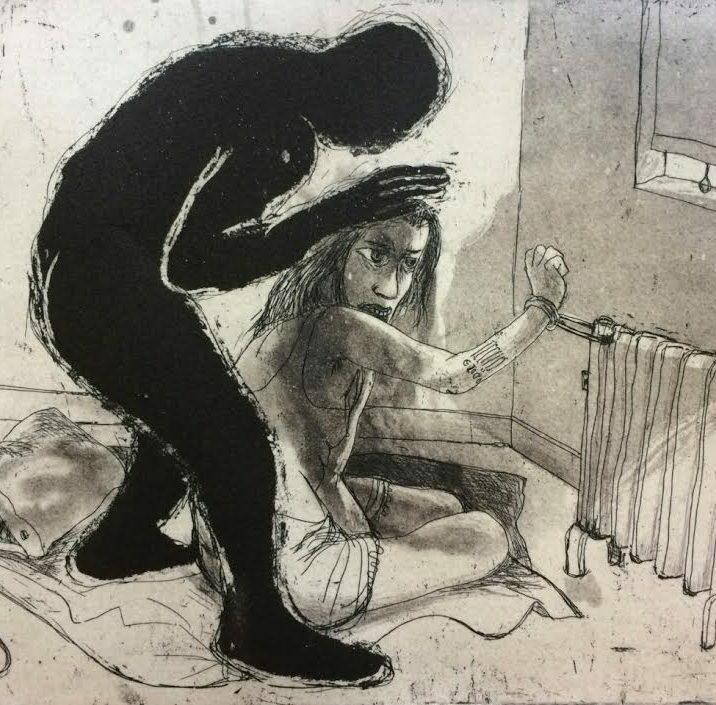 In the latest instalment of our 'Artist Spotlight' series ACS artist Marcelle Hanselaar discusses her appreciation of etching as a medium, and how the art of the German expressionist Otto Dix has influenced her ambitious project on capturing grief. I work equally in 2 mediums, oil painting and etching. I also occasionally make drawings and handmade artists books. Although I studied at the Royal Academy in The Hague, I learned painting, the king of all mediums, from my artist friends while I was modelling for them. Many years later, when I had come to live in London, a friend offered me a place on a printmaking course at Morley College. Initially I tried to translate my paintings into 3 or 4 plate colour etchings, but over time I learned to think of etching as a tone and line drawing medium. I came to love the harsh bitten, corrosive quality of nitric acid, which my images began to match. Coming from a painting mind-set I mostly work my plates through many layers and let the image develop playfully. Working in two different mediums means there is a lot of cross-pollination, both in ideas and technically, for instance the scraping of a plate translates itself in putting highlights in my painting with sandpaper. Sometimes I work the same image in both mediums, developing an idea in different ways. My subject matter comes from either my own experience, from things I have heard or seen, or a mix of those, but of course a successful painting or print is the result of the transformation of an idea through the character of the medium used. I love museums and that first itch for a new work often comes from being excited by the mastery of the medium by other artists, anywhere from the Baroque to the 1950s. Recently, inspired by Otto Dix’s stunning portfolio of 50 prints ‘The War’ (Dix interestingly was in turn inspired by Goya’s ‘Disasters of War’) I started a series of etchings entitled ‘The Crying Game’. Aside from the intensity of Dix’s own war experiences and the urge to tell the world what he had seen, these prints are also technically one of the best and most varied examples of the etching medium and for a long time I wanted to test myself like this. I have never experienced war directly. But we are bombarded with images of war and the devastating effects it has on ordinary people and I ask myself how I would behave if I’d found myself in such circumstances. And then there all kinds of grief we subject each other to; punishing the other for being different, the rigid adherence to old rules of dominance and power, and I feel I will burst if I do not give some kind of voice to the damage we are doing. I would like this ‘Crying Game’ portfolio to be seen as a comment, to be reflected upon, to say we cannot be indifferent. I made 20 plates in about 3 months and then I had run dry. Each plate is etched differently, I used zinc and a mix of spit-bite, aquatint, white-ground, sugar-lift, to name a few, and it was exhilarating to freely experiment and learn things as I went along. Just now I have started an additional 10 prints for The Crying Game, one day I hope to make it up to 50 prints but will see if I have got that in me. Right now I am in discussion with the New Walk Museum in Leicester, which has the biggest collection of German Expressionist art on display, and we are planning to do a gallery intervention with The Crying Game etchings in the room alongside expressionist war images, with the idea to highlight ongoing conversations between artists and a similar urge to report on the time they live in. I started out as an abstract, hard edge painter and initially I was very afraid of spoiling the canvas. I was a very timid painter. The same went for my printmaking. I became bolder and more outspoken and personal after years of struggle and frustration. My first breakthrough into that kind of boldness was a series of figurative paintings I did after the death of my mother in 1991. Her death combined with a teaching appointment in China, where I was kind of thrown in at the deep end, catapulted me into figuration and finding my own voice. Marcelle Hanselaar’s most recent work will be shown by dealer Julian Page at the forthcoming London Print Fair, 4-7 May 2017 at The Royal Academy of Arts, London.